Oenophiliacs beware, we are destroying wine here. Or are we? For your next wine tasting party, try Hyperdecanting. Better yet, try hyperdecanting a two buck chuck to improve its flavor. Drinking cheap wine is a collegiate right of passage. It may lack flavor, but it pretty much does the trick. All the better if you live close to a Trader Joe’s and can grab some Charles Shaw Two Buck Chuck. Which, coincidentally, was actually two bucks when I was in college. Anyway, keeping with the collegiate theme, for a long time, I stayed away from cheap red wine, or red wine at all I guess. Then over time, you grow up, your tastes change, and then you try things. Such is life. One thing I wish I had known then, besides the need to aerate red wine, I mean really, what college kid owns a decanter (don’t answer that), was that I could substitute a cheap aerator for the party blender! 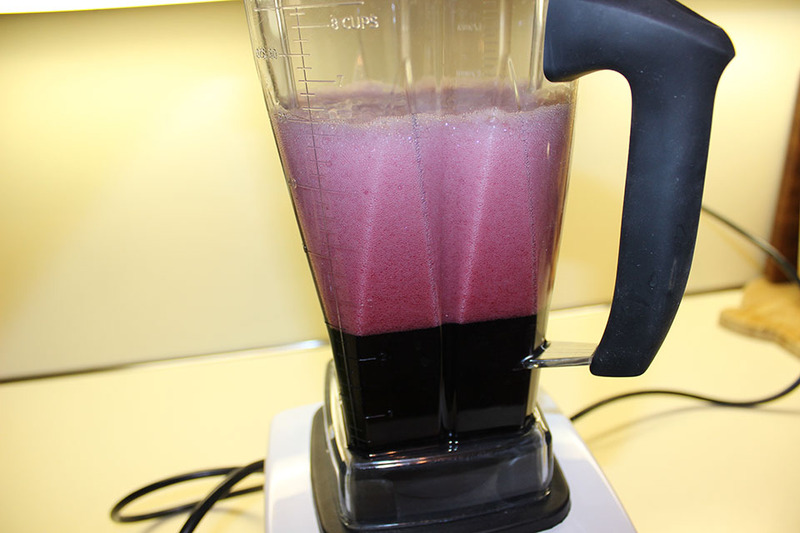 In order to improve the taste of cheap red wine, I could have used the blender to hyperdecant it. Which, if you think about it, is really a total college move. Poor form on my part. Anyway, to learn more, read on. How do I decant wine without a decanter? By hyperdecanting it, otherwise known as pouring the wine into a blender. Hyperdecanting wine is a way to change your wine tasting experience. It is a way to (maybe?) change your cheap red wine into a good red wine. Well, maybe not good wine, but it will certainly help a two buck chuck earn some points. In fact, after hyperdecanting, you won’t feel shamed for serving it at your next wine tasting. Decanting is just the process of pouring the wine out of it’s bottle into another container. That could be a decanter, a carafe, or even another wine bottle. Or a glass, which conveniently is the best place for wine. So I’m told. The first reason is to separate out any sediment or dregs that have collected over time. Beyond the aesthetics and visual appeal of the wine in your favorite goblet, there are various arguments about the effect that sediment has on flavor. To be clear, though a bit gritty, sediment is not harmful. The second reason is to aerate the wine. As the wine takes in oxygen, cleverly called the breathing process, it helps open up the flavor of the wine, unlocking and releasing aromas of fruits and spices: black cherry, peppercorn, etc. What type of wine should I decant? Preferably red wine. Cabernet, Syrah, Barolo, and some red blends lend themselves well to decantation. Essentially, bold red wines that are rich with tannins work best. The decanting process helps reduce the drying effects of the tannins. Can I hyperdecant white wine? Yes. Although, white wines are aged for shorter periods, and as such, decanting seems to be less necessary. There is benefit to hyperdecanting a chilled white wine. 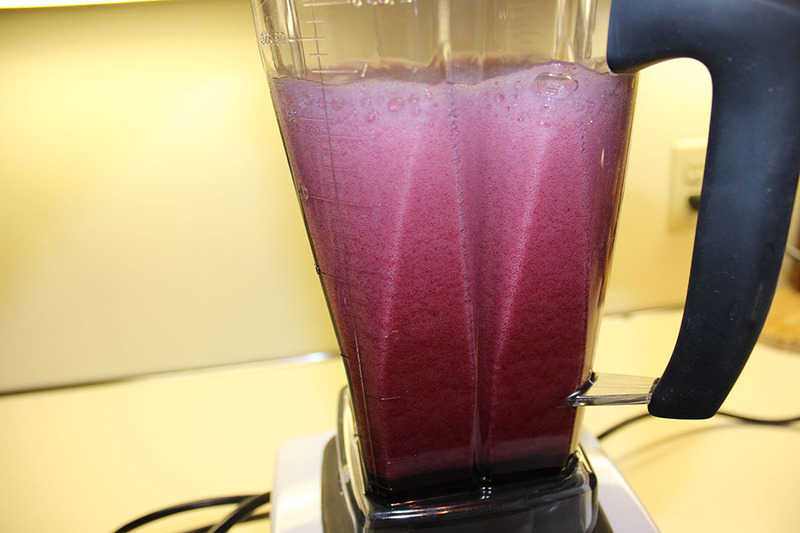 Blending it will help warm it up, especially true if using a Vitamix. This is handy if you need to serve the wine immediately, as cold wine doesn’t allow for maximum aromatics. There is some thought that more mature wines need less decanting as mature wines will lose their flavor as they are exposed to the breathing process. Your mileage may vary. As for my experiment, I used a Vitamix, which is anything but delicate. So, typical bottle age rules did not apply. Besides, we are livening up a two buck chuck, not a jeroboam of 1945 Chateau Mouton-Rothschild. What is two buck chuck? 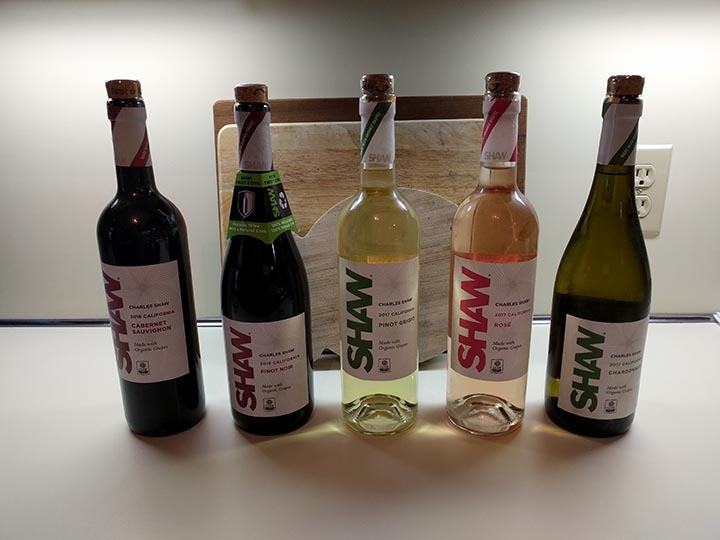 The term was made famous due to Trader Joe’s selling of Charles Shaw wine for two dollars. Two buck chuck was a revelatory sensation for wine drinkers, brown baggers, college kids, and everything in between over the last 15 years. Thus, the low cost of entry makes it perfect for an experiment in hyperdecanting. 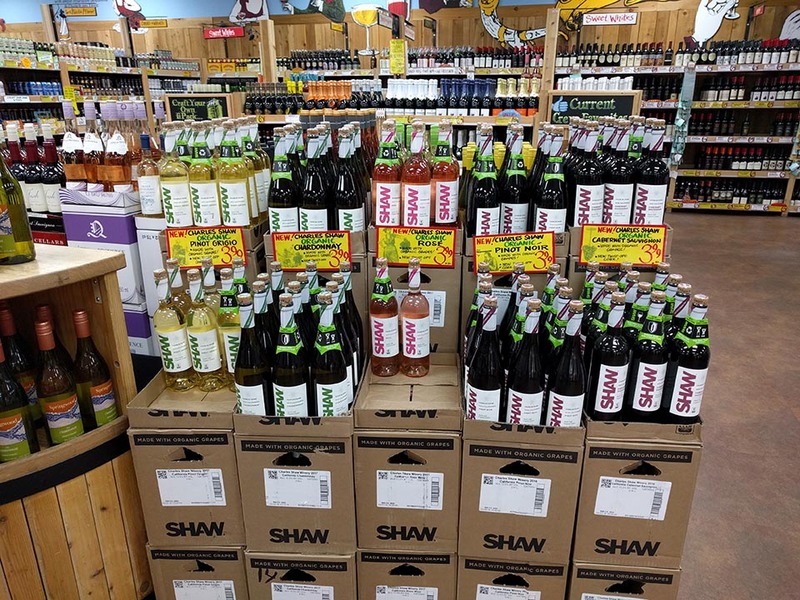 Despite the exercise in marketing over how the two buck price tag came about, Fred Franzia, creator of old school boxed wine, purchased the Charles Shaw label and drove a bargain product built for the bourgeois. Why is two buck chuck so cheap? In general, it’s because vineyards and wineries need to sell off their surplus without diluting their main brands (see Pacific Peak). So, some good value can sometimes be derived in bargain-priced wine. This was exactly the case with the 2002 Charles Shaw Shiraz. 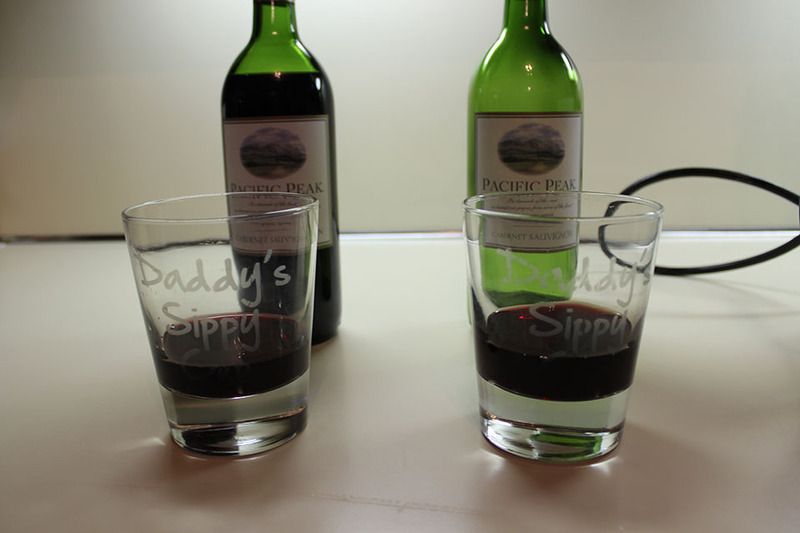 For the experiment, I went with another bargain-priced wine, the Pacific Peak Cabernet Sauvignon ($2.57/bottle). Who owns Pacific Peak? I couldn’t find the answer, even after diving into what I call Search Purgatory, or, page 4 of Google. Any of the Charles Shaw wines should be considered with regard to what is the best trader joe’s wine under $10. They are exceptional for the price point. Can I use an expensive vintage wine? Sure. However, the thought is that young wines blossom from aeration, where as premium, old vintage wines don’t need the same treatment. That being said, it’s probably best to start with a cheap red wine and work your way up. As a reminder, the goal of the experiment is to make your two buck chuck pass muster during your wine tasting. If you can convince your friends that you are serving a 90-point wine due to hyperdecanting, then you can save yourself some serious coin. Even professionals can’t always agree with judging the quality of wine. 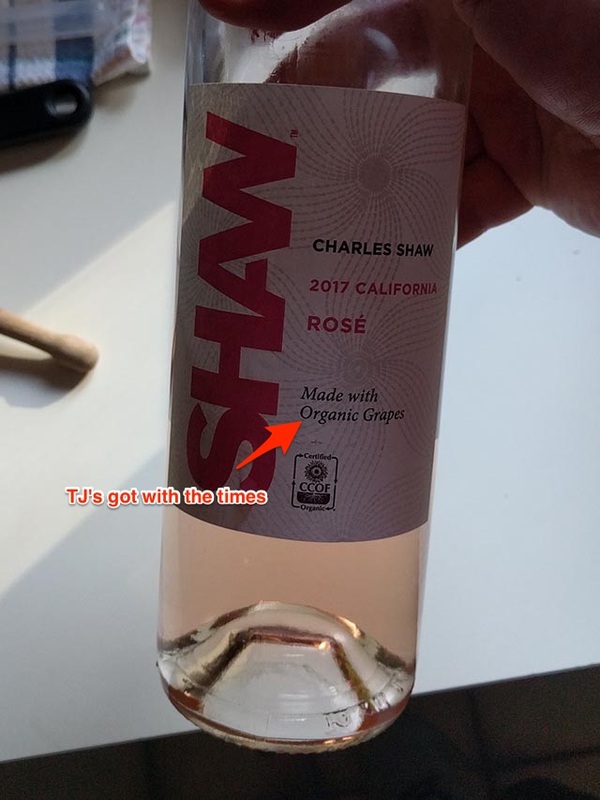 Trader Joe’s steps up their game by offering organic two buck chuck. Would Charles Shaw be proud? I don’t know. But I do know that organic grapes costs more, yet the price of these Charles Shaw two buck chucks haven’t risen dramatically. Something doesn’t add up. The resealable cork is a tasteful and welcome addition to these wine bottles. Why does red wine need to be aerated? Does decanting wine make a difference? Aeration helps remove undesirable aromas, thus “improving” the taste perception of the wine. 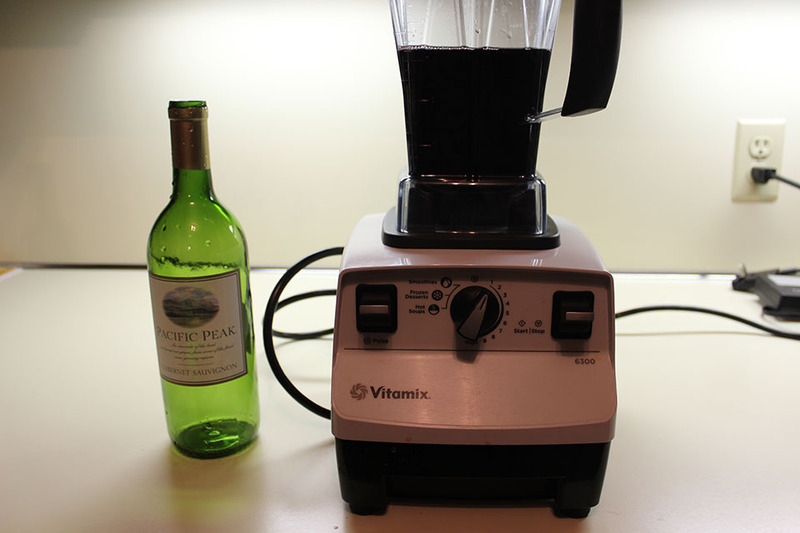 Can you put wine in a blender? Yes! That is exactly what hyperdecanting is! It’s just a fancy word for aerating your wine in a blender - or - letting wine breathe. The best part is that blender is the most inexpensive wine decanter because you (probably?) already own one. Better yet, it can serve as a cheap carafe. Multi-tasking FTW! It’s simply just the process of using a blender to aerate the wine. The main purpose of hyperdecanting is save time. Sure, traditionalists will mock this approach, but if you’re reading, I’m guessing you aren’t one. Proper decanting steps include keeping the bottle upright for a period of time before decanting or using a light to determine if any sediment is being transferred. We don’t care about those one bit. So set aside your red wine decanter set, pull out your Vitamix, and fire it up. Empty bottle, Vitamix ready to go, I think we are good. Start blending. One to two minutes of blending the wine will create a ton of froth. You will need to let it settle before doing anything else. Give it a few minutes to let the wine settle. If not, you will probably have more of a mess on your hands than you want. Now is the fun part, pour it into your favorite glass (or goblet, chalice, etc. if you’re into that sorta thing) and enjoy. Perhaps it was just some confirmation bias, but I am going to side with the hyperdecanted wine tasting better. I will have to repeat the experiment again with a more independent judge. What won’t hyperdecanting do for a two buck chuck? First off, it’s not like freeze drying food. You should consume the wine immediately, or shortly thereafter. It won’t turn a cheap red wine into a good red wine. Let’s face it, you couldn’t slide your hyperdecanted two buck chuck past an actual sommelier. But, there is still plenty of room to impress your friends at your next wine tasting party. May I suggest a fine Pacific Peak Cabernet Sauvignon? Or if you want to add a touch of class, you could opt for the Wente Cabernet Sauvignon . Try a good cheese pairing, say … a rich mahón with some jamón serrano. As an aside, I’m told that mahón is the “cheddar” of Spain, and, not a bad gift for your cheese of the month club. Also, if you actually spring for a jeroboam of 1945 Chateau Mouton-Rothschild, please please please opt for the Reserva Jamón Ibérico De Bellota. A jeroboam is a wine bottle that contains between 4 bottles (3 liters) and 6 bottles (4.5 liters) as it depending on the type of wine. Maybe it’s the holiday season, maybe you are looking for a change - either way, you could try infusing your own vodka. It’s a fun way to spice up boring vodka.